Feeding pigeons is prohibited by ordinance in Albuquerque. This ordinance also requires that property be kept clean of mess caused by pigeons when conditions become a nuisance. 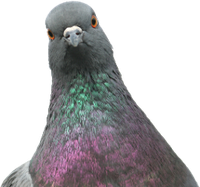 While pigeons will occasionally appear at bird feeders, parks or other such areas in small numbers, the City of Albuquerque’s goal is to prevent large flocks of pigeons from being attracted to regular feeding, thus creating property nuisance or damage or unsanitary conditions. Here are some basic facts about this law, or you can read the entire ordinance. Feeding all other birds is allowed as long as reasonable efforts are made to exclude pigeons. Careful selection of feed, feeders or feeding methods can discourage pigeons. In some cases, pigeons will become so numerous that it is necessary to stop feeding temporarily until they move on. First violation of this ordinance will result in a written warning to stop feeding pigeons, along with corrective measures. Subsequent violations will result in a $50 fine, or $50 each day of an ongoing violation. Property owners are also prohibited from maintaining conditions that constitute pigeon harborage. This refers to any condition that attracts or sustains abnormally large numbers of pigeons, and could include providing food, water or other shelter, or in other ways enticing pigeons to roost in large numbers. Urban Biology staff can provide guidance on excluding pigeons and discouraging them from becoming a problem at bird feeders. When limited by their own ability to find food, pigeon populations will remain at reasonable, natural levels. When provided with readily available food, pigeon populations can become excessive and create health risks, unsanitary conditions and property damage and nuisance. The City of Albuquerque does not control pigeons, and does not conduct regular cleaning of droppings from streets and sidewalks. Poisoning or shooting pigeons is prohibited in Albuquerque. For pigeon removal or control, contact a pest control service. The best way to prevent pigeons from visiting your property is by removing food or water sources as well as eliminating roosting and nesting sites. If you feed songbirds, pigeons may become a problem. Stop feeding birds until the pigeons move on. Blocking access to holes or ledges on buildings prevents pigeons from accessing ideal nesting locations; Use chicken wire to cover access points. Roost sites should be altered to prevent pigeons from landing. Bird spikes, electrical wire, or fishing line can work well. If you have pigeon droppings on your property, taking simple precautions when cleaning bird droppings can help prevent disease. Keep the area wet. Dry droppings are more likely to become dust, which is then inhaled. Wear disposable gloves and clothing that can be easily washed. Use bleach to clean items that may be routinely handled by people. Hire a professional if cleaning a large amount of droppings is necessary.